Android and iOS remain the two key operating systems. Meet the 10 year old with serious attitude. The Android operating system (OS) was born into a fragmented smartphone world filled with infant OS competitors fighting for dominance. Remember Symbian, which ran on millions of Nokia phones? How about Bada, Samsung’s own system? And of course there was Blackberry, a company that in 2010 boasted more market share than iOS. But operating systems that were serious players a decade ago have since disappeared into obscurity, leaving Android and iOS to battle it out. Android and iOS control today’s mobile market. Since 2010, the smartphone landscape has changed beyond recognition. Unit sales have exploded, growing from 297 million to over 1.5 billion today, and squabbles over market share have been replaced by the ascendancy of two powerful platforms. 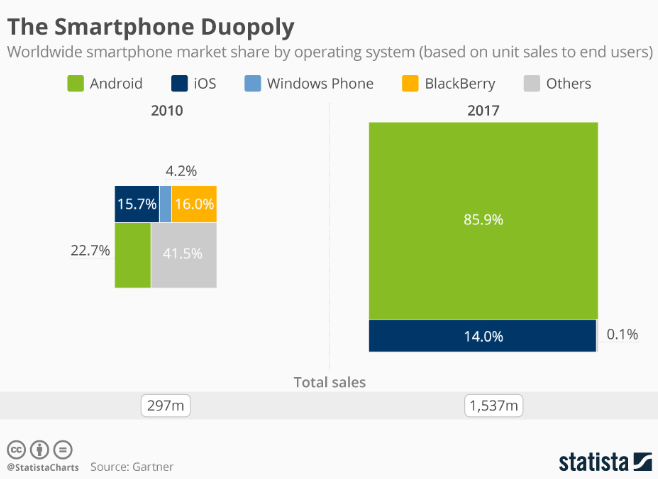 Market research company Gartner attributes 99.9% of worldwide smartphone sales to end users in 2017 to devices running Android and iOS. From controlling a portion of the market, Android – with an 85.9% market share in 2017– has cornered it. Google bought the platform from its California-based creators Android Inc. in 2005, releasing yet another OS format into an already crowded marketplace in 2008. Back then, app developers were faced with a tough choice of which platform to support. Google simplified this decision by getting several leading smartphone brands on side, such as Sony, Samsung and HTC. Android ate large chunks of the market as a result of these industry giants designing phones around its platform. Symbian OS relinquished its market leader crown in 2010, and Android continued to gobble up a greater share in subsequent years. Former leaders such as Microsoft’s Windows Phone and Blackberry are now inconsequential. 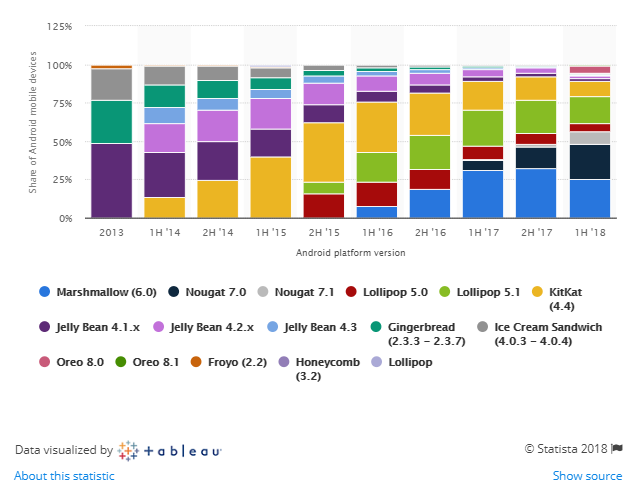 Android has issued numerous versions of its OS platform, all named after popular sugary treats. Released in 2009, Cupcake was the first of many upgrades and allowed users to copy and paste text into web browsers and upload videos to YouTube. A suite of other upgrades followed, but the most popular versions have been Marshmallow, Nougat and Lollipop. Ongoing strong collaborations with phone manufacturers and ahead-of-the-game features like faster internet access and constant improvements to video and audio have all helped Android become a juggernaut. Whereas Apple’s iOS platform supports the iPhone, iPad and Apple watches, almost every other phone and tablet on the market run Android. Although tablet market growth has been slower than smartphones, Android became the leading tablet operating system in 2012. With no direct competitors, Android’s dominance looks set to continue in the coming years. But a decade from now it’s anyone’s guess whether the smartphone OS market will look the way it does today.